In October of 2018, a public meeting regarding the land development project for a Jellystone Park Camp and Resort was held at the First Church of God in Point Pleasant. 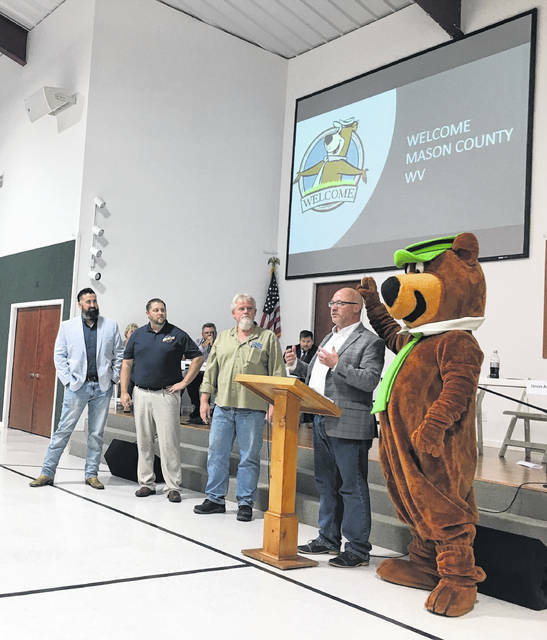 POINT PLEASANT — The Mason County Commission recently met, discussing a sewer study presented to the members regarding Route 35 which would affect the future plans of the proposed land development project for a Jellystone Park Camp and Resort. The commissioners in attendance were President Rick Handley, Sam Nibert, and Tracy Doolittle along with County Clerk Diana Cromley and County Administrator John Gerlach. Jason Asbury, vice president GEO-environmental and field services at Terradon, along with Kristen McClung, project manager/engineer at Terradon, were in attendance to discuss the sewer study they formulated for Route 35. Both Asbury and McClung have been working alongside Dave Nibert of the Mason County Public Service District to help with developing this study. Handley commented Route 35 is projected to be completed in October of 2020 and no sewer system exists along Route 35 currently and a sewer study had to be done before any grants could be applied for and obtained. “Any grants I’ve ever been a part of, part of the grant package is the preliminary engineering plan and it is preliminary, it’s a moving target and that’s sometimes hard for people to grasp that it’s a moving target, but it’s planning, you have to take just basic input data and try to generate a dollar amount because you don’t know how much money to start applying for grants if you don’t have something to fall back onto, so in this engineering report we’ve given you two cost estimates,” said McClung. One plan is to run a conventional gravity sewer the entire 17 miles with a new treatment plant. McClung explained there are several stream crosses and several creeks in between that would require pump stations and they would be pumping back to where the treatment plant is located. She recommended the treatment plant be located at the lowest point as it would make the service district as large as possible. Feeder lines could be drawn as customer use grows as well. This projected plan cost is approximately $31.5 million dollars. The other plan would be provide a sanitary sewer system to just the proposed land development on Route 35, possibly the proposed Jellystone Park Camp and Resort, to get the development up and running and to then start to generate other customers. This projected plan cost is approximately $10.5 million dollars. Lance Thornton, of The Thornton Group & LandSu Land Development, Inc./co-chairman of Erie Automotive Aftermarket Holdings, asked the commissioners if they spoke with representatives from the U.S. government on possible funding towards the Jellystone Park Camp and Resort project. Handley commented he and fellow commissioners had to go over the proposed sewer study before seeking any assistance from any source on either project. Thornton then asked what the commissioners’ next plan of action was regarding moving ahead with the land development project for Jellystone Park Camp and Resort. Handley explained the next plan of action is to take this sewer study to the Region 2 Development Authority to work on writing and applying for grants. The commission also needs a commitment that the proposed development plans on Route 35 will be built as the cost burden of the sewer system cannot be put on the customers who may be affected by the new system. Thornton then inquired a timeframe from the commission as possible alternative land for the Jellystone Park Camp and Resort has been considered regarding this project. Commissioners indicated they will not be able to give any updates until after they speak with Region 2 Development Authority representatives.